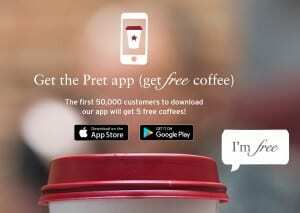 Download the Prep App and the first 50,000 customers to do so will receive FIVE FREE coffees at Pret A Manger. The Prep App is available on iOS and Android devices. There are multiple Pret A Manger locations in Boston and you can find your nearest location here. For more information regarding free coffee through the Pret App, please head here. Are you going to download the app for FIVE free coffees? *Don’t forget to download the Potbelly App soon for a free Sandwich! I got mine over the weekend and was able to order it through the app to get the free sandwich– just had to pick it up! It was super easy! Thanks, Kate! I got my 5 free drinks!